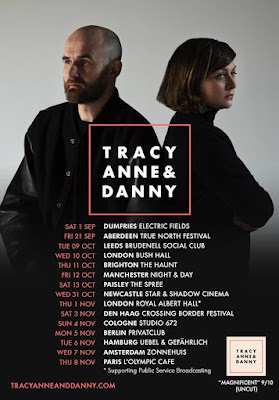 The titular duo here are Bristol-based singer/songwriter Danny Coughlan, who generally records under the name Crybaby, and Tracyanne Campbell, once of Camera Obscura of this parish. This venture being Tracyanne's first back into the world of performing following the break-up of her previous band subsequent to the untimely death of colleague and close friend Carey Lander. The pair's first release is the unimaginatively titled Tracyanne & Danny. And rather like the first time I heard a Richard Hawley album, all manner of vaguely familiar-sounding, but maddeningly-unidentifiable fifties and sixties influences abound. Although, the intro to O'Keeffe clearly borrows heavily from the melody to Carly Simon's Coming Around Again, and I am as sure as a non-muso like me can be, that Deep in the Night recycles the same chord progression as the Velvet Underground's I'll Be your Mirror. This gig took place as part of the Spree Festival, in what was little more than an ornate tent pitched in the centre of Paisley's County Square. But the acoustics were a whole lot better than we had any right to expect from such an intimate venue, with both Tracyanne and Danny's contrasting yet complementing voices showcased to fine effect. Susan Bear was just too cool. I loved the way she casually tossed aside her plectrums to switch to plucking mid-song. But then I appear genetically predisposed to be in the thrall of ladies with bass guitars. Sean Reid's keyboard contributions were best described as peripheral. But when he picked up his sax, he elevated proceedings immeasurably. Tracyanne & Danny get down! For a few tunes mid set Mr Tracyanne, Tim Davidson, dropped to layer some pedal guitar into the already sumptuous mix. It Can't Be Love Unless it Hurts.